The easiest way to change the font in your presentation is to change the font scheme of the theme. Or, if you want to substitute one font for another, you can replace the font. After you choose a presentation theme on the Design tab, you can change the font for your presentation in Slide Master view. 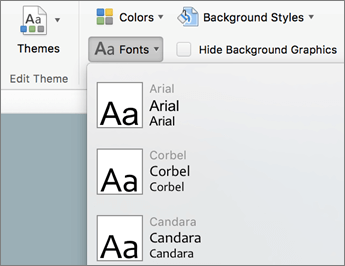 On the Slide Master tab, click Fonts, and then click the font that you want for the theme. 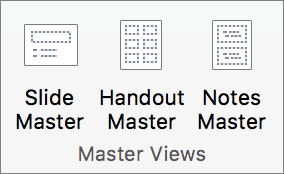 You can change the fonts for your presentation at any time in Slide Master view. On the Themes tab, under Theme Options, click Fonts, and then click the font that you want for the theme. On the Format menu, click Replace Fonts. On the Replace pop-up menu, click the font that you want to replace. On the With pop-up menu, click the new font that you want to use, and then click Replace.